Perfect as snacks for guests or just for the family to munch on at home. Preheat the grill. Place the rashers on a grill rack and cook them for 4–5 minutes until golden and crispy, turning halfway. Drain on kitchen paper and set aside. Place a sheet of baking parchment in the base of a 40 x 30cm roasting tin. Place the bread mix in a bowl and make up according to the pack instructions. Roll out on a lightly floured surface to a large rectangle measuring 40 x 30 cm. 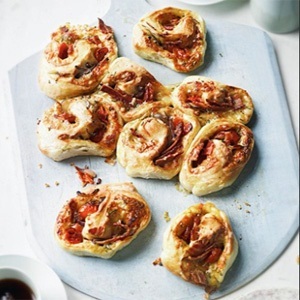 Sprinkle the cheese and rosemary over the dough then top with the rashers of bacon and scatter over the halved cherry tomatoes and red onion slices. Starting from the longest side of the rectangle roll up tightly to form a long roll, pushing any pieces that fall out back into the bread. With a serrated knife, slice into 12 rounds and arrange cut-side up in the bottom of the roasting tin. Drizzle with olive oil, cover loosely with clingfilm and leave to rise in a warm place for 45 minutes. Remove the clingfilm and bake uncovered for 20–25 minutes until golden. Leave to cool for 5 minutes then remove from the tin and transfer to a serving board. Serve warm with sausages and poached eggs.